Our Carnival Booths provide an attractive way to display and use our carnival games. These also work well for vendor booths, if you need space for sponsors who’d like to give away product, or for selling a variety of items. 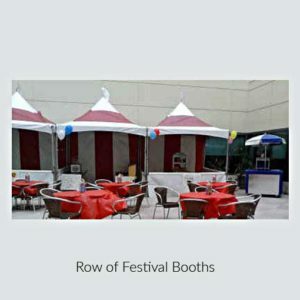 Our Carnival Booths measure 10 feet wide by 10 feet long. We have several styles available. There’s the quick to install EZ Up style, which has a top and side walls of heavy fabric. You may have seen EZ Up Tents at your local hardware store, however, ours are commercial grade so they are not flimsy and the tent posts are made of stronger material than what you commonly find for sale. You can also choose our Festival style with the pointy top and heavier vinyl material commonly used for tents. Our Carnival Booths come with a full back wall, and three half walls. Our Carnival Booths also can be equipped with netting, as required for food service vending. They work well alone or in rows. 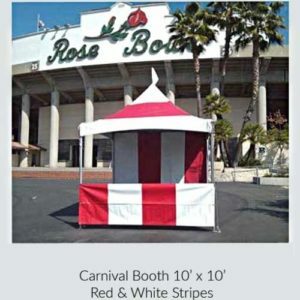 Carnival Booths are available from Party Pronto in Red and White Stripe, All White, or we can provide a red “bra” or stripe for the top. Just let us know what works best for you.